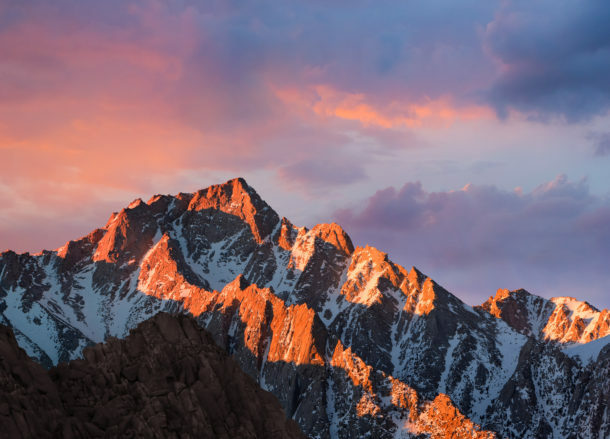 When Apple debuted macOS Sierra to the world, we all got a glimpse at the gorgeous wallpaper of a sunset alpenglow hitting a mountain range on the screens of the demo Mac. Apple has also given us a look at that beautiful mountain range wallpaper on their preview page for MacOS Sierra too. But you don’t have to download macOS Sierra 10.12 or wait the final release to get the wallpaper right now, and in fact you can get two slightly different variations of the same great desktop background. Click on either of the thumbnails below to launch the full sized MacOS Sierra wallpaper into a new window so that you can download and save it for your own desktop. Both are beautiful variations of the same picture that are just cropped a bit differently, and the differences are subtle. 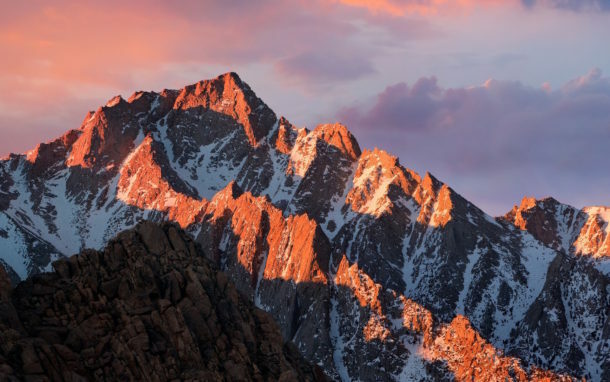 Wondering which mountains are shown in the MacOS Sierra wallpaper? Well, it may not be much of a surprise, but macOS Sierra is named after the Sierra Nevada mountain range, which runs north south through the state of California near the border with neighboring Nevada. 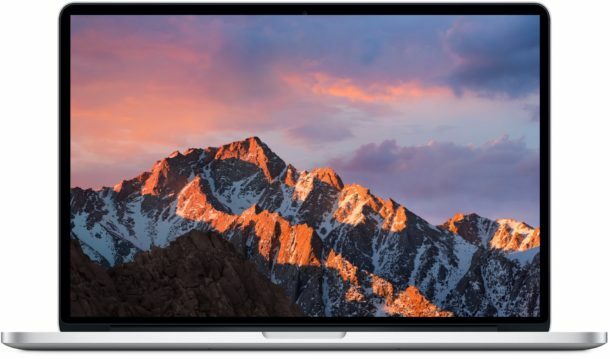 It’s an absolutely beautiful stretch that includes many sights, monuments, parks, and recreational activities, and the scenic beauty is simply stunning and world class, making it easy to see why Apple picked the Sierra mountain range as both the name of their new MacOS and also as the relevant desktop wallpapers. MacOS Sierra is set for a fall release date, though beta testers can download and install it now. Great wallpaper, using it now but also creating a Sierra boot drive! Can’t wait to install it and try Siri on Mac!! Click on the pictures, the picture thumbnails are the links to the wallpapers. You using Lynx or something? Anyone know the name of the mountain that is shown above? Mt. Williamson? It’s Lone Pine Peak. It’s 1500′ lower than Mt. Whitney. Those are the Alabama Hills in the foreground. What Steve D. said: it’s Lone Pine Peak outside of Lone Pine, CA on Whitney Portal road – taken from a viewpoint inside of Alabama Hills. I wish it were easier to find the photo credits and info about the photos. I would love to know where these were shot, and by whom. I’ve tried googling this a few times, but keep coming up short. Any ideas? Same, smh. It’s a real pain. Thanks for this. My sister changed my original background to a banana and I wanted this one back.